For those of us living on the east coast this has been an extremely wet, rainy season. The rain kept coming over and over and it has prevented many growers from applying fungicides to their tomato plants. This problem was amplified this year due to the fact that many nurseries selling tomato transplants had their plants affected with late blight. So the problem was here before the wet weather occurred. From New York to Virginia and as far west as Ohio, late blight has shown up in tomatoes this year. The fungus can be devastating to tomato growers, as late blight was the same disease responsible for killing the potato plants in the 1850’s, during the Irish Potato Famine. The problems associated with late blight include a yellowing and wilting of the tomato plants, eventually leading to the plant dying and possibly wiping out the entire crop. Affected plants can produce millions of spores that will spread from plant to plant. Late blight also affects the fruit. 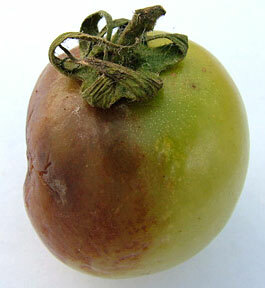 A green tomato, with early stages of late blight will exhibit small, firm,dark, greasy lesions. The size of the spots may vary, from 1/2 inch to 33% of the surface of the tomato. These lesions will later produce the fungal spores, leading to a soft decay. Late blight is considered as a decay, and decay is considered a “free from” defect in tomatoes. 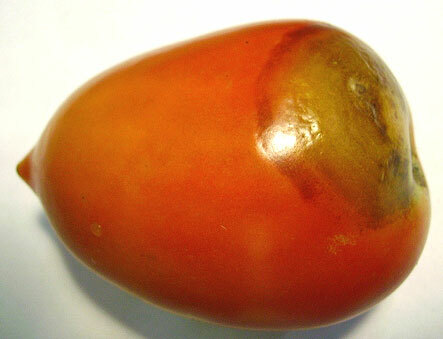 If the late blight is still in the firm stage (as shown in the image above), but you can identify the discoloration as late blight, then the tomato still should be scored as decay. Also, remember the U.S. Grade Standards allow for up to 5% of the tomatoes to have decay. Good post. We had some Virginia tomatoes inspected recently and the USDA inspector didn’t know what caused it. He said it was from sprayburn. Glad you have the answer.